You must make reservations at least 5 minutes in advance of the time at Armani Ristorante 5th Avenue. 4/5 train to 59th Street, 6 train to 51st Street, F train to 57th street/6th Avenue, N,R,W and Q train to 5th ave/53rd Street and the E/V to 5th Ave.
Armani Ristorante features Italian Aperitivo Monday through Friday, from 5:30PM to 7:30PM. On Thursdays, Armani Ristorante offers its premium Aperitivo, selecting its amazing no-charge finger food appetizers from different regions of Italy. It lends its beautiful lounge bar to all the Armani aficionados as the perfect meeting place on Fifth Avenue in Manhattan. For questions regarding the planning of your party at Armani Ristorante/5th Avenue please contact our event coordinator. Immersed in the heart of Manhattan, overlooking Fifth Avenue; Armani Ristorante lends itself to forge a new form of dining experience. The dazzling Italian trendy decor by Fuksas mingled with culinary creations communicate through each bite and each eyesight the personality and the beliefs of a distinctive philosophy that has changed the world through its innovative creations. In a place where vanguard cuisine marries traditional Italian cuisine our guests will savor the wonders of our exclusive dishes, and the impeccable care of our service absorbed in our unique surroundings that remains together elegant and relaxed. Join us for Easter Sunday! We will be offering an exclusive prix-fixe menu all day. 4 courses priced at $105pp & wine pairing an additional $95pp. A la carte dining will not be available. The Manu mix should allow for some simple dishes. All dishes seems complex. The dining experience was great except another patron was FaceTiming and was loud and distracting in the restaurant. Service was slow. Drinks were just ok. I ordered sea bass and it was chewy and seemed frozen. I have eaten at this restaurant 4 times over the last 2 years (twice for lunch & twice for dinner) and as far as food & service, lunch was outstanding, and dinner both times was not as memorable. This time I was dining for dinner. The restaurant does an excellent job with appetizers and pasta dishes, but main courses never seem to be seasoned well or a wow factor. Service during lunch has much attention to detail however at dinner I had to ask for the table to be cleaned when at this price level that should be a given. I also felt lunch cocktails were prepared to perfection but at dinner the same cocktails just weren’t as perfectly proportioned in the cocktail. Also I feel there was a change in the by the glass wine selections which are now a much lower quality. What this restaurant does well they do very well but there’s no consistency. Good food. And service was excellent. I will always come here. Beautiful, and great food and service. But very pricey. Excellent food, risotto and tagliatelle verdi are amazing. All the personnel is very welcoming and attentive. It’s always a nice experience to go to Armani restaurant, looking forward to the next dinner. 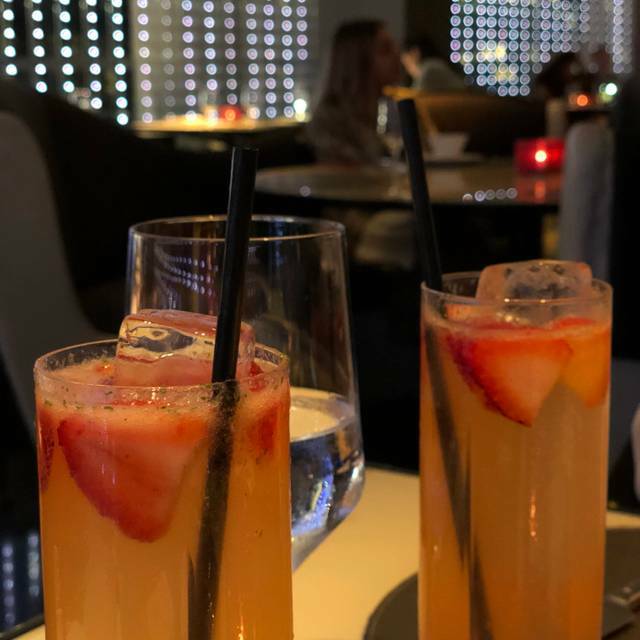 We had the most amazing dining experience at Armani/Ristorante. From the moment we were greeted by the General Manager to the last bite of our desserts, every morsel was delicious and we were very well looked after the by staff. We were lucky to dine the day that the new menu was unveiled - such a treat. And what a view! We had been referred by a friend as we were coming to New York . I made a reservation 10 days or more in advance for lunch . We arrived on time gave our name and the hostess acknowledged us took our coats and was seemingly going to take us to our table when 3 people walked . The hostess greeted them , took their coats and led them to a table by the window . We were just left standing in between coast room and restaurant. Then a server looked at us said asked if we were ok ? I said we were just deserted . Some else came and led us to the bar area. Service was erratic as our server was making drinks at the bar also . Lastly it was a price fixed menu only and that was not clear when I booked on line . Food was excellent but left feeling underwhelmed with hostess and service . the food is excellent but the service was non existent. we had trouble getting a waiter for every request we had. A beautiful setting with excellent service and food. Incredibly expensive and the food and especially service doesn’t match it. Beautiful room and presentation of food. Good for a special occasion or if you want to make an impression on your guest. But I was a little shocked when I got the bill for lunch without drinks or dessert for salad and a vegetarian pasta dish. Service was excellent. Excellemt food service and ambiance. Food choices were interesting and all my guests where happy with their choices. Wine selection was modest, but varied from regions around the world. The food is utterly over priced. Perhaps their rent is quite high, so they have to gain from the patrons. The food is blend. Period. Armani has no business in the kitchen, just stay with fashion. I am pretty sure, he has nothing to do with the over priced dining. So sorry to be honest about it. Pricing was ridiculous for the food quality. Come here often, food is excellent, tables are far apart! Great dinner. A very good surprise! Always great lunch. Very kind and professional service. Tasty italian food. Amazing waiters. Worth the price! I attended Armani Ristorante on Sunday for lunch. It was a nice experience since the moment we stepped into the bar. Nice ambiance, the food was delicious, the wine suggestion was perfect. The overall experience was very pleasant. Can't wait to go back! An unexpected and exceptional dining experience!! 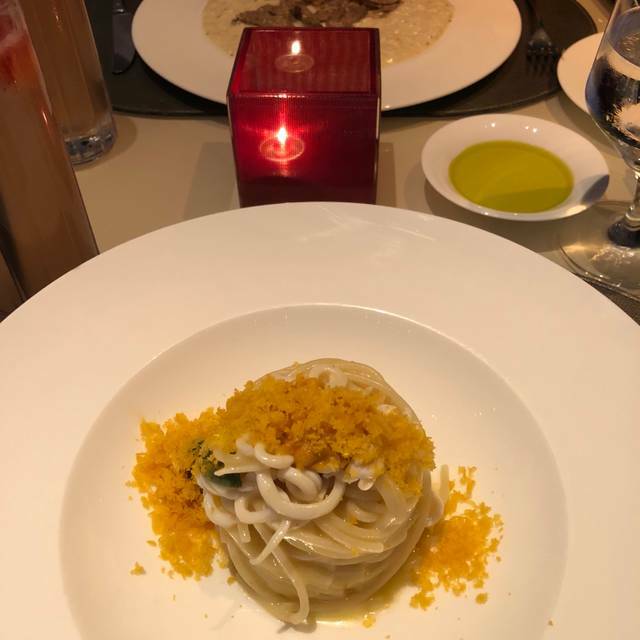 We were surprised to learn that the Armani store on Fifth Avenue had a gourmet Italian restaurant on one of the upper floors. Once we discovered it, we made a reservation. We were not disappointed in any way. The food, the service, the atmosphere all exceeded our expectations. The sommelier recommended a wine that perfectly complemented our entrees, and all courses were delicious and appropriately sized. We would definitely recommend this restaurant, and we will dine here again on our next visit to New York.